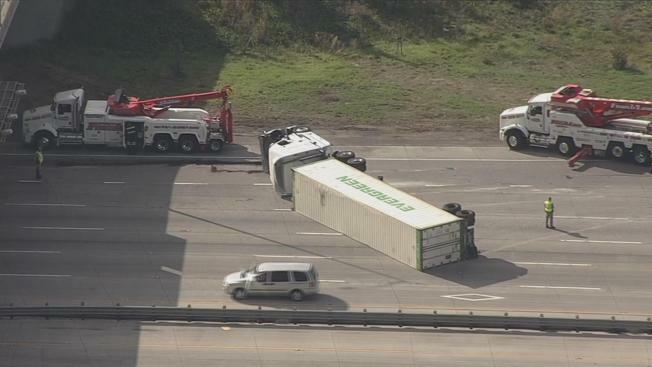 A big-rig crash that blocked several lanes of southbound Highway 101 just north of Interstate 880 Tuesday morning has been cleared. The driver entered the roadway from a circular on-ramp before flipping the truck on its side around 10:30 a.m. All but one lane of traffic was blocked, prompting crews to issue a Sig-Alert shortly after the rollover. Crews were slowly able to drag the truck toward the shoulder and open up the far left lanes of traffic before lifting the vehicle upright around 11:45 a.m. The California Highway Patrol reported that the truck was cleared just after 12:15 p.m.
CHP Officer Ross Lee said officials are currently investigating the cause of the crash, but he mentioned that speed may have been a factor. Ross added that the driver sustained minor injuries and was transported to a local hospital.